In a parliamentary report released by the Standing Senate Committee on Banking, Trade and Commerce in June 2016 stated that it was “angered to hear that some of the recently negotiated international trade agreements would make it easier for international businesses to trade with Canada than it currently is for Canadian businesses in one province/territory to trade with other provinces/territories.” The point of this statement is not to condemn international trade agreements, but rather emphasize the bizarre nature that Canadian Provinces have stronger trade relations with the world than each other. The Standing Senate Committee on Banking, Trade and Commerce, Tear Down These Walls (Ottawa: Senate Committee Reports, 2016), iii. 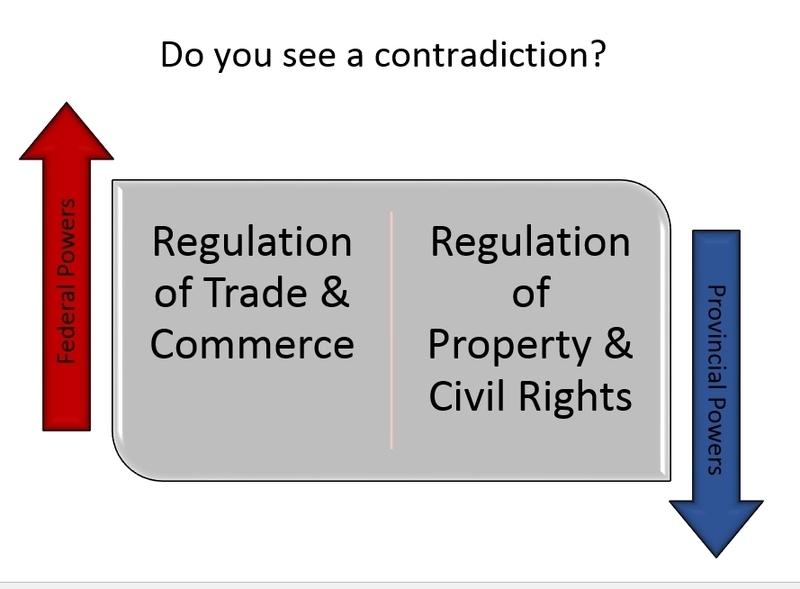 What does the Constitution say about interprovincial trade? The conflict between federal and provincial jurisdictions has been a central hallmark of Canadian federalism. Section 91 outlines the jurisdictional boundaries of the federal government. In terms of trade, subsection 2 of section 91 allocates “[t]he regulation of Trade and Commerce” under the auspices of the federal government. While section 91(2) appears to assert an absolute clarity with respect to federal authority over trade, section 92 complicates the matter. Section 92 outlines the jurisdictional boundaries of the provincial governments. Subsection 13 of section 92 authorizes provincial jurisdiction over “Property and Civil Rights in the Province.” Trade, being the exchange of property, could correspondingly be under the jurisdiction of the provinces. The Constitution seemingly fails to provide a tangible framework between federal and provincial power to facilitate interprovincial trade. Constitution Act, 1867, s 91, Part VI, 1867. Constitution Act, 1867, s 92, Part VI, 1867. 121. All Articles of the Growth, Produce, or Manufacture of any one of the Provinces shall, from and after the Union, be admitted free into each of the other Provinces. Section 121 clearly states that internal trade barriers should not exist within Canada. This does not suggest that property and civil rights should belong under federal jurisdiction, but instead demand an outcome on interprovincial trade. However, section 121 could only be achieved if trade was fully controlled by the federal government. As noted by Justice Duff in The King v. Eastern Terminal Elevator, “[...]no single province, nor, indeed, all the provinces acting together, could put into effect such a sweeping scheme.” While section 121 has no direct implication on sections 91 and 92, the allocation of trade to the federal government would be more practice means of achieving the desired outcome of interprovincial free trade. Constitution Act, 1867, s 121, Part VIII, 1867. Reference re Validity of Section 5 (a) Dairy Industry Act,  S.C.R. 1, page 75. What do the Courts say interprovincial trade? 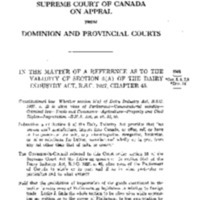 This case established the double aspect doctrine where “subjects which in one aspect and for one purpose fall within s. 92, may in another aspect and for another purpose fall within s. 91.” This precedent legitimized dual claims to an area of law where the federal and provincial government have equal importance. In terms of trade, the double aspect doctrine opens the door to federal and provincial fracture over trade where their roles have a legitimate claim in certain aspects. There may, therefore, be matters not included in the enumeration [of section 91], upon which the Parliament of Canada has the power to legislate, because they concern the peace, order, and good government of the Dominion. If it were once conceded that the Parliament of Canada has the authority to make law applicable to the whole Dominion, in relation to matters which in each province are substantially of local or private interest, upon the assumption that these matters also concern the peace, order, and good government of the Dominion, there is hardly a subject enumerated in Section 92 upon which it might not legislate, to the exclusion of the provincial legislatures. [T]he exercise of legislative power by the Parliament of Canada, in regard to all matters not enumerated in section 91, ought to be strictly confined to such matters as are unquestionably of Canadian interest and importance, and ought not to trench upon provincial legislation with respect to any of the classes of subjects enumerated in section 92. To attach any other construction to the general power which, in supplement of its enumerated powers, is conferred upon the Parliament of Canada by section 91, would […] not only be contrary to the intendment of the [Constitution] Act, but would practically destroy the autonomy of the provinces. The precedent set by the Local Prohibition case was based on the principle set in subsection 16 of section 92 which stipulates that provincial jurisdiction comprises “[g]enerally all Matters of a merely local or private Nature in the Province.” Following this principle, the JCPC also had a legal framework to resolve seemingly contradictive clauses between sections 91 and 92, such as section 91(2) – the federal power over the regulation of trade and commerce, and section 92(13) – the provincial power over property and civil rights. The JCPC ruled that federal powers over trade and commerce in 91(2) must yield to provincial powers over property and civil rights established by 92(13) where there is local concern. The Local Prohibition case ultimately implemented the double doctrine aspect into Constitutional jurisprudence in terms of trade. While the Local Prohibition casefavoured provincial autonomy in general, provincial power of property and commerce enumerated in section 92(13) was extended even further in Gold Seal Limited v. The Attorney General of the Province of Alberta. 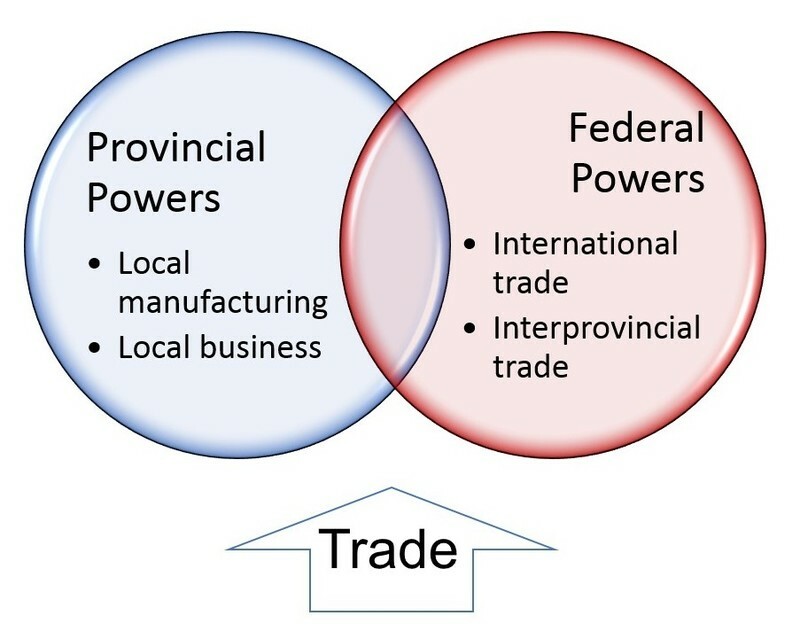 Provincial power over trade allows the barriers to interprovincial trade. In the Gold Seal case, the plaintiff was unable to export and import liquor products across provincial lines. The solicitor for the appellant argued that interprovincial trade barriers contradicted section 121 of the Constitution Act, 1867. Section 121 of the Constitution states, “[a]ll Articles of the Growth, Produce, or Manufacture of any one of the Provinces shall, from and after the Union, be admitted free into each of the other Provinces.” The Gold Seal caseheld that section 121 only applies to the flow of customs posts. All other forms of trade are not protected by section 121 and thus are subject to interprovincial trade barriers. In a policy paper published by the MacDonald-Laurier Institute, Ian Blue argues that the current interpretation of section 92(13) by the courts is not only economically problematic, but unconstitutional given section 121. In accordance with the purposive principle followed by the Supreme Court of Canada, Blue asserts that the Gold Seal Case was wrong and simply unconstitutional by current standards of Constitutional interpretation. From a historic point of view, the Gold Seal Case seems inconsistent with the centralist national vision held by the Fathers of Confederation. Unless it is shown that the authors of the Constitution intended this outcome, the interpretation of the Gold Seal Case does not follow the purposive principle and is thus unconstitutional. Interprovincial trade barriers may not be a result of federalism as intended in the Constitution, but a poor judgement in the Gold Seal case. In the Tear Down These Walls parliamentary report issued in June of 2016 by the Standing Senate Committee on Banking, Trade and Commerce, the committee offers several recommendations. The primary recommendation is a renewed Agreement on Internal Trade (AIT) which was last signed over 20 years ago. If the agreement is not renewed, the committee suggests that the Trudeau Government should pursue a reference on section 121 from the Supreme Court of Canada. The consequence of such a reference would force the Supreme Court to re-examine the precedent from the Local Prohibition case and the double aspect doctrine in terms of trade. (a) manufacture, import into Canada, or offer, sell or have in his possession for sale, any oleomargarine, margarine, butterine, or other substitute for butter, manufactured wholly or in part from any fat other than that of milk or cream. The act was a federal regulation on trade which prohibited all commerce in relation to margarine or any substitute butter. The government sought reference to the constitutionality of section 5(a) of the Dairy Industry Act. In defence of the legislation, solicitors for the federal government argued that the federal government has a constitutional right to regulate trade of margarine under sections 91(2) – the federal power over trade and commerce, 91(27) – the federal power over criminal law, 95 – the federal power over agriculture, and on the principle of “peace, order, and good Government” outlined in the outset of section 91.
that the prohibition of manufacture, offer, sale or possession for sale of the goods mentioned is ultra vires of Parliament. It is legislation in relation to property and civil rights which cannot be supported under any head of section 91. Nor can it be supported as legislation for the peace, order and good government of Canada. Section 91 did not trump the provincial jurisdiction over property and civil rights cited in section 92(13). The Court determined that matters relating to local manufacturing and business were subject to section 92(13), while international and interprovincial trade are subject to section 91(2). Justice Rand, also speaking for the majority, asserted that criminal law under section 91(27) is only applicable where there are “penal sanctions” and serves the “public interest,” such as “[p]ublic peace, order, security, health, [and] morality.” Rand concluded that trade law was therefore not applicable to the criminal domain under section 91(27). As for section 95, Rand asserted that federal regulation of agriculture could only be justified on grounds of national imperative which outweighs the local interest. Rand concluded that no imperative exists in terms of agriculture which could justify such extreme federal action. In sum, the Margarine Reference established legal precedent for federal regulation of trade only in terms of exportation or importation across interprovincial or international borders. In this respect, the double aspect doctrine clearly applies. Reference re Validity of Section 5 (a) Dairy Industry Act,  S.C.R. 1, page 5. Reference re Validity of Section 5 (a) Dairy Industry Act,  S.C.R. 1, page 1. Reference re Validity of Section 5 (a) Dairy Industry Act,  S.C.R. 1, page 71. Reference re Validity of Section 5 (a) Dairy Industry Act,  S.C.R. 1, page 28. Reference re Validity of Section 5 (a) Dairy Industry Act,  S.C.R. 1, page 2. Reference re Validity of Section 5 (a) Dairy Industry Act,  S.C.R. 1, page 49. Reference re Validity of Section 5 (a) Dairy Industry Act,  S.C.R. 1, page 50. Reference re Validity of Section 5 (a) Dairy Industry Act,  S.C.R. 1, page 52. Peter W. Hogg, Constitutional law of Canada, Student Edition,(Toronto: Carswell, 2000), 361. Attorney General for Ontario v. Attorney General for the Dominion, and the Distillers and Brewers’ Association of Ontario,  A.C. 348 (J.C.P.C. ), page 6. Attorney General for Ontario v. Attorney General for the Dominion, and the Distillers and Brewers’ Association of Ontario,  A.C. 348 (J.C.P.C. ), page 7. Attorney General for Ontario v. Attorney General for the Dominion, and the Distillers and Brewers’ Association of Ontario,  A.C. 348 (J.C.P.C. ), page 8. Reference re Validity of Section 5 (a) Dairy Industry Act,  S.C.R. 1, page, 59. Attorney General for Ontario v. Attorney General for the Dominion, and the Distillers and Brewers’ Association of Ontario,  A.C. 348 (J.C.P.C. ), page 11. Ian A. Blue, “Free Trade within Canada: Say Goodbye to Gold Seal,” The MacDonald-Laurier Institute, May 2011, 2. Gold Seal Ltd. v. Alberta (Attorney-General), (1921), 62 S.C.R. 424, page 428. 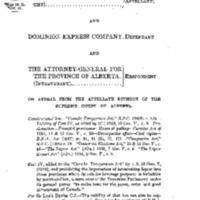 Gold Seal Ltd. v. Alberta (Attorney-General), (1921), 62 S.C.R. 424, page 430. Ian A. Blue, “Free Trade within Canada: Say Goodbye to Gold Seal,”, 4. Ian A. 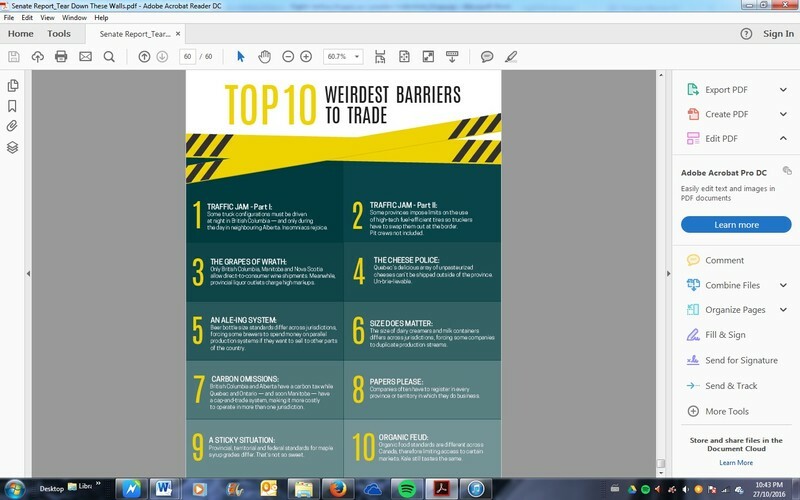 Blue, “Free Trade within Canada: Say Goodbye to Gold Seal,” 5. The Standing Senate Committee on Banking, Trade and Commerce, Tear Down These Walls (Ottawa: Senate Committee Reports, 2016), 10. The Double Aspect Doctrine is based on Margarine Reference Case. 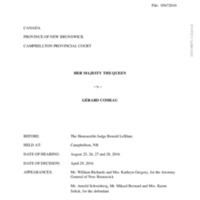 The Attorney General of New Brunswick appealed this decision to the New Brunswick Court of Appeal. The Court of Appeal rejected the appeal in October, 2016. See: R v Comeau, 2016 CanLII 73665 (NB CA), <http://canlii.ca/t/gvd55>, retrieved on 2017-03-10. Perhaps this case will set a trend followed in other provinces. And as for our relationship with margarine, for a time, most provinces had legislation that required manufacturers of margarine to ensure that the product's colour was sufficiently different from that of butter to ensure that consumers could not confuse the two. Margarine was required to be coloured, usually orange or bright yellow. Such legislation was designed primarily to protect provincial dairy industries. It seems, however, that margarine has gone mainstream. The last province to have such legislation on the books was Quebec, and it repealed its margarine legislation in 2008, but not before a protracted political and legal battle in that province.